Italian sculptor. Son of a silversmith, he became the leading sculptor in Enlightenment Florence. In the tradition of Gianlorenzo Bernini, he often supplemented his marble works with accoutrements in bronze and other materials. He was trained by Giovanni Battista Maini in Rome, where his works include a statue of St Joseph Calasanctius (1755) in St Peter s.
He arrived in Florence in 1769, recommended by his Roman background and familiarity with the Antique, and was named official court sculptor in 1770. Grand Duke Leopold (later Emperor Leopold II) first employed him to restore the Niobe group and the Apollino (both Florence, Uffizi). His portrait bust of Grand Duke Leopoldo (1771-74; Florence, Pitti) is an image of tightly controlled intensity, with imperious bearing and antique costume. Spinazzi contributed to the development of Santa Croce as the Florentine pantheon with monuments to three celebrated citizens: Giovanni Lami (d 1770), with a majestically draped statue of the jurist; Angelo Tavanti (d 1782), with a relief portrait; and Niccolo Macchiavelli (1787), with a graceful seated allegorical figure of Politics (all in situ). In 1792 he added an angel to the Baptism by Andrea Sansovino and Vincenzo Danti above the Porta del Paradiso (east door) of the Baptistery of Florence Cathedral. 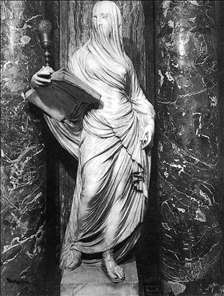 His virtuoso marble figures of heavily veiled women, for example Faith (1781; Florence, S Maria Maddalena de Pazzi) and Religion (from the tomb of Varvara Jakovlevna, Princess Beloselskij, 1794; Turin, Museo Civico), follow precedents set by Antonio Corradini as well as the classical convention of drapery folds that cling as if damp.